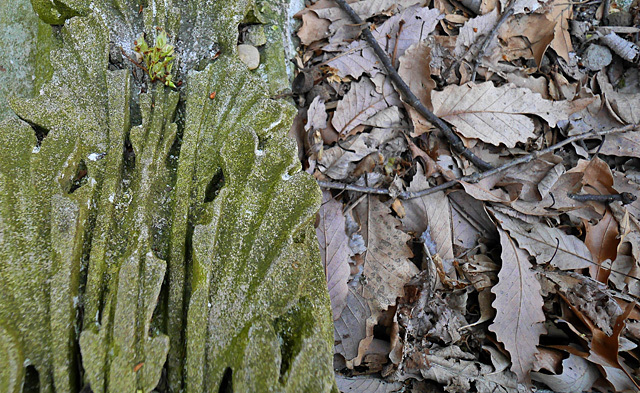 From a trail in the northern reaches of D.C.’s Rock Creek Park, you can glimpse dozens of gray stone slabs casually stacked among the oaks and beeches. 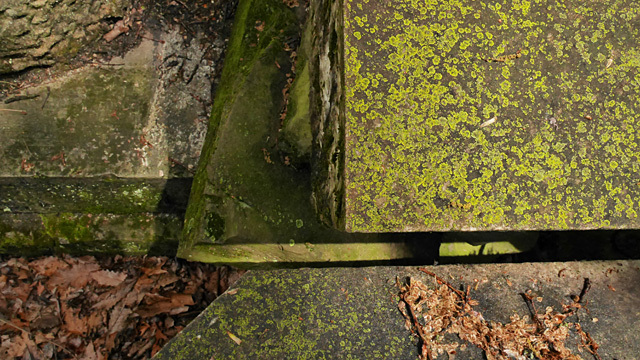 There, past a public stable and a National Park Service maintenance yard, someone has dumped tons of stone carved with dentils, keystones, columns and occasional numbers. 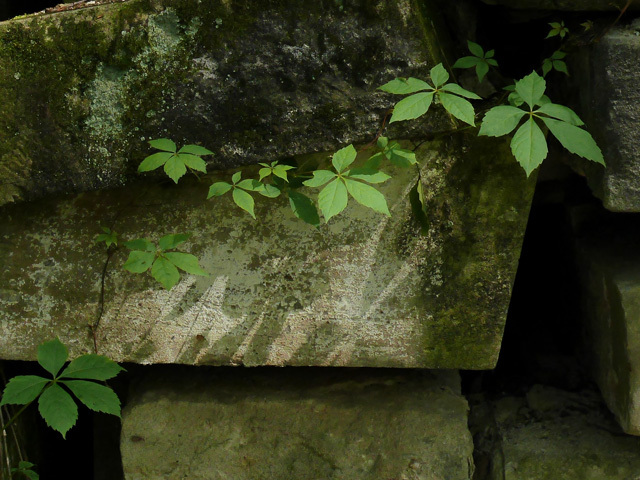 It seemed like some kind of federal ruin, unmarked at the site and on most maps, but labeled “Capitol East ruins” in one Park Service handout we had noticed. 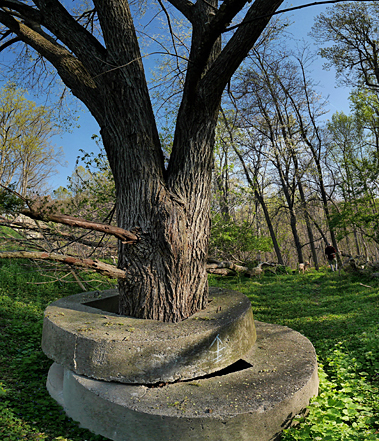 In a mysterious sideshow near the stoneyard, a mature tree has somehow grown up through the holes in two massive doughnuts of stone. How the tree did that, I still don’t know. (Do you?) 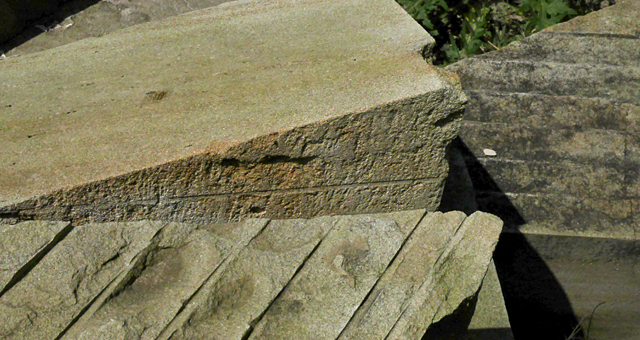 But on the Web it was easy to learn the source of the piles of classy second-hand stone. 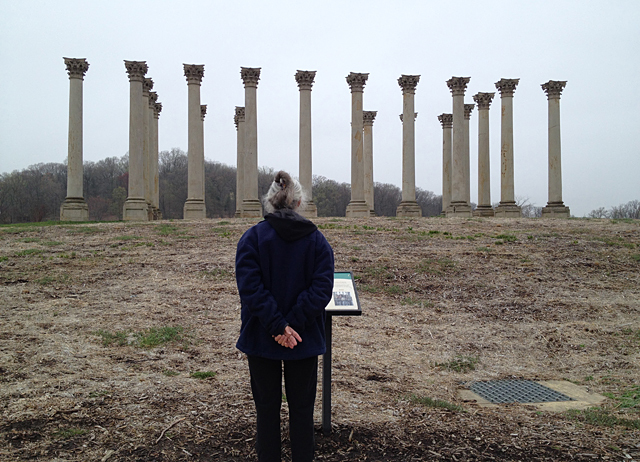 It came from the same place as the surreal grouping of columns resurrected at the National Arboretum (below), way across town in Northeast D.C. 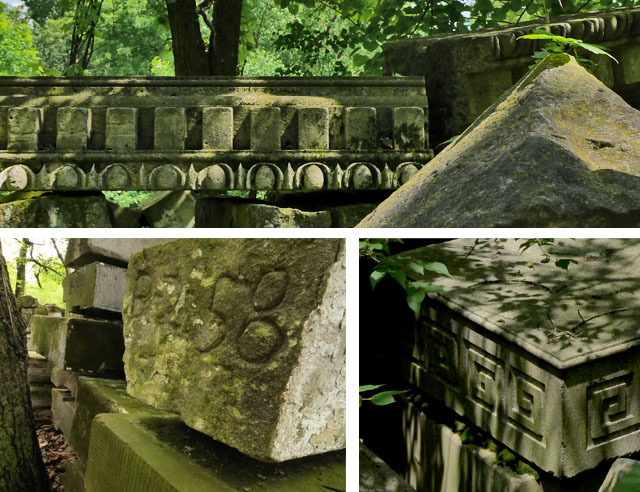 Both the columns at the Arboretum (above) and the stones in north central Rock Creek Park were retired from active duty around 1960 when Congress had the U.S. Capitol’s East Front extended about 33 feet eastward, according to Capitol Hill blogger Robert Pohl. The renovation added interior space that Congress wanted in the old core of the Capitol, Pohl explains, and it replaced the decaying sandstone facade with tougher marble. Architects said thickening the Capitol’s midsection was also in keeping with the Capitol’s expansion in every other dimension. That provides a deeper, more proportionate pedestal for the much taller, multi-tiered dome completed after the Civil War. 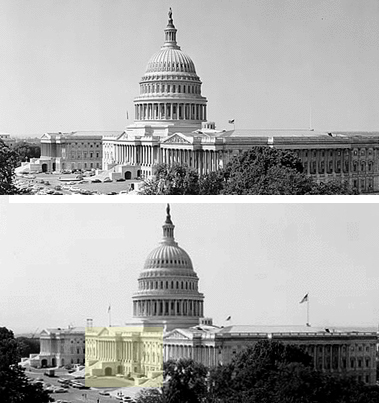 At the same time, the Capitol’s width was doubled with the addition of the House and Senate wings, completed by 1868. 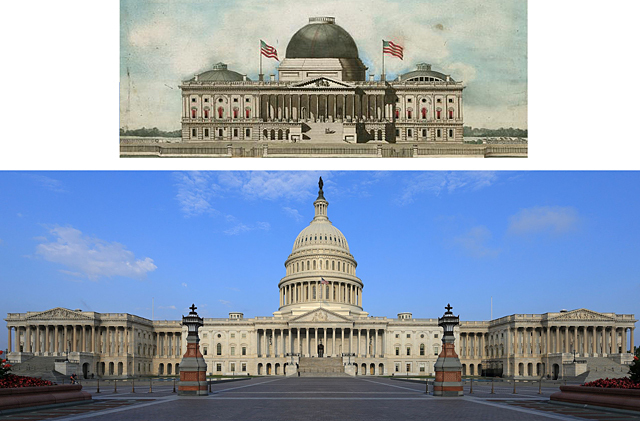 Compare the Capitols below: (1) the 1834 edition, with its smaller dome, which remains at the center of (2) today’s complex, with its added wings. To the eye, and especially looking at it head-on, the East Front today looks much the same as in the 1950s. It’s hard to spot the difference in depth without closely comparing the official “before” and “after” photos at left, both shot at an oblique angle. I highlighted the pushed-out portico with a yellow tint. 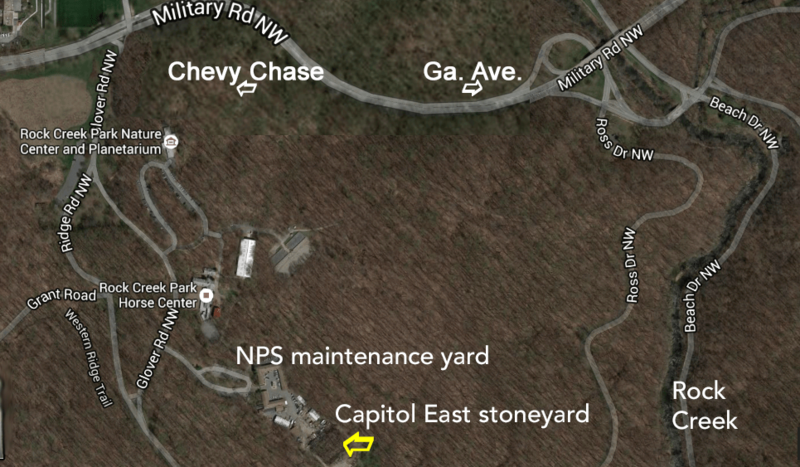 You can examine the Capitol’s surplus stoneyard for yourself near the west side of Rock Creek Park at Military Road, NW. To get there from the intersection of Military Road and Oregon Avenue, drive south into Rock Creek Park. Oregon Avenue becomes Glover Road. Follow signs to the park’s Nature Center and then follow the trail behind the Horse Center stables. 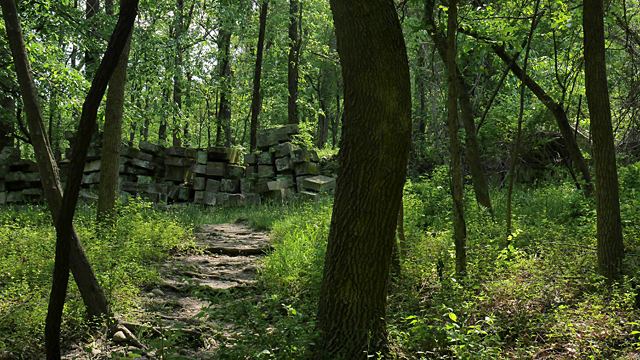 This long wooded hillside flanking Rock Creek is also one of the highest, broadest and quietest reaches of the park. If you’d enjoy tramping farther, bring a GPS device, trail map or a good sense of direction. 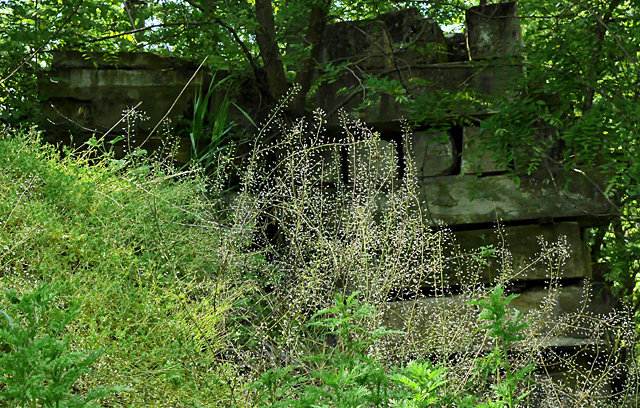 Numerous earlier self-described “urban explorers” have documented the Capitol East stoneyard on their blogs, including DCinruins. Abandoned, forgotten, rusty, rotten and bizarre: These places are lens candy for an international subculture of urban explorer/bloggers who call their endeavor “urbex”. I jumped into the Web’s bottomless pit and brought back my admittedly incomplete sampling of notable urbex bloggers.